International Harvester introduced a new line of trucks, the R Series, in 1953. Included was the 115-inch-wheelbase Travelall, a panel truck equipped with side windows and either two or three rows of passenger seats. Side-opening "barn" style rear cargo doors were standard, with a tailgate available as an option. A Travelall name badge was mounted on the front cowl directly below the International name badge. A few L-Series trucks were also produced with windows and seats in 1952, but whether the Travelall name was used that year is unknown. 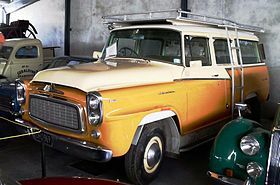 Prior to 1952, International station wagon type vehicles were mainly woodies – third-party company conversions with wooden bodies, that were simply called "station wagon". A few K-Series panels in the latter 1940s were built with windows and seats and used by airlines to move people at airports. The Travelall name continued to be used for station wagon versions of the succeeding S-line, A-line, and B-line pickup trucks. The 1953 through 1957 Travelalls (R- and S-Series) shared the same 115 in (2,921 mm) wheelbase and had two passenger doors. Access to the rear seats in these two-door Travelalls was gained by flipping up the passenger side of the front seat. The R-Series Travelall was powered by the SD 220 inline-six engine, rated at 100 HP gross. The S-Series BD 220 engine was similar. The S-Series Travelall was offered as the S-110 or heavier duty S-120, which was also available with optional four-wheel drive beginning in 1956, and for that reason has been called one of the earliest full-sized, civilized, all-terrain people movers, now known as SUVs. Introduced in 1957 for the 1958 model year, the A-series (for "Anniversary", marking fifty years of International Harvester truck production) offered a 2nd passenger side door for improved access to the rear seats. Models A-100, A-110, and A-120 all came with 113 to 154 hp (84 to 115 kW) six-cylinder engines, with four-wheel drive optional on the A-120. The design changes paralleled those of the A-series pickups. Although only lightly modified, the B-Line trucks that appeared in 1959 offered upgraded options for the Travelall. Power steering, power brakes, V-8 engines, and other comfort, convenience, and visual appeal features were introduced to make the Travelall more mainstream and less commercial. The Travelall was offered in the B-100/B-110/B-112 ½-ton range only in 4x2 form. The B-120 was a ¾-ton rated model and that was the only Travelall to come in four-wheel drive in this era. A B-122 model featured uprated springs for a higher GVW. The B-Line trucks carried on into the 1961 model year, when another mild facelift transformed them again into the C-Line. In April 1961 the Travelall underwent the same changes as the pickup range upon which it was based. The new C-series Travelall benefitted from a whole new chassis with all new independent front torsion bar suspension. Aside from the lower body, the most obvious visual difference were that the twin headlights were now mounted side-by-side, and a new grille of a concave egg-crate design. The wheelbase for the C-100/C-110 Travelall went up to 119 inches, as the front wheels were mounted further forward. This adjustment increased the front clearance angle in spite of the lower body. This series was available either with a flip-down tailgate or two doors. The fold down gate had a window which wound down electrically. Development continued in a gradual fashion, becoming the D-series in 1965. A steady stream of new grilles and headlight treatments set the model years apart until a more thorough makeover took place in 1969. Until this model change, the Travelall had been considered merely a version of the related pickup truck; after the facelift the Travelall became a separate series. The Travelall (along with the 1000 D-series pickups on which it was based) was last redesigned in the first half of 1969 with a more modern look which echoed that of the smaller Scout. Available engine options for the 1000, 1100, and 1200 D-series Travelalls ranged from the unusual 232 ci AMC inline-six via three IHC V8s (of 304, 345, and 392 cubic inches) and four-wheel drive was optional on the 1100 and 1200s. Power outputs ranged from 145 to 253 hp (108 to 189 kW). In 1973 and 1974, due to a short supply of IHC's own V8s, AMC's 401 cubic inch V8 was available as an option called the V-400. The slow-selling six-cylinder was dropped for 1972, and by 1975 only IHC's own V8s were still available, with outputs down to 141–172 hp (105–128 kW). A Bendix anti-lock brake system called Adaptive Braking System, operating only on the rear wheels, was available on later Travelalls and pickups (introduced in late 1971). Due to the expense of the novel system, it was a rarely selected option. Despite very high owner loyalty and satisfaction, sales steadily declined and production of passenger pickups and Travelalls ended entirely in May 1975; production of the Scout continued until 1980. The company exists today as Navistar International, and continues to make medium and large trucks. Travelalls were also produced with raised roofs and extended wheelbases for applications such as school buses, ambulances and airport limos. Many of these modifications were performed by the Springfield Equipment Company and were marketed by International. In 1973 and 1974 a modified Travelall was marketed as the International Harvester Wagon Master. The roof over the cargo section was removed to make a short pickup type bed. The target market for the Wagon Master were people who pulled fifth wheel RV trailers. The exposed cargo area provided the space needed to mount the fifth wheel for the trailer. The Wagon Master was very much like the Chevrolet Avalanche produced in the early and mid 2000's. In season 3, episode 19 of the CBS comedy-drama Northern Exposure the local shaman Leonard Quinhagak (played by Graham Greene) drives a Travelall. In subsequent episodes he drives a 1976 Chevrolet Chevelle Malibu wagon. In the 1993 drama film What’s Eating Gilbert Grape the characters Becky and her grandmother (played by Juliette Lewis and Penelope Branning, respectively) drive a 1972 2 wheel drive Travelall. The vehicle breaking down and leaving the two women stranded in a small Iowa town is a significant plot point in the movie. In the films Grumpy Old Men and Grumpier Old Men Max Goldman drives a 1974 Travelall. In the apocalyptic novel Lucifer's Hammer by Larry Niven and Jerry Pournelle, Harvey Randall uses a Travelall extensively. Folk musician Greg Brown sings about a Travelall in his song Laughing River. In the television show Z Nation, season 3, episode 7, the group of survivors is seen leaving a boathouse on a 4th generation Travelall. In season 5 episode 19 of Hawaii 5-0: “Will the real Mr Winkler please die” two blue Travelalls are used by the team to transport people to a remote safe house. It seemed unusual because all other vehicles in the show were Ford. Given the timing, perhaps it was a promotion for the latest model. They look like the 1972/73 1010. ^ a b c d e Allen, Jim (1 November 2012). "1959 International Harvester B-120 Travelall – Four Wheeler Magazine". Four Wheeler Network. Archived from the original on 2018-01-07. Retrieved 2018-01-07. ^ a b "The 1958 Station Wagons". Changing Times: The Kiplinger Magazine. Washington, DC. 12 (2): 22. February 1958. ^ a b Lamm, Michael (May 1971). "She's no beauty, but owners say, "Look beneath the skin!"". Popular Mechanics. NY, NY: The Hearst Corporation. 135 (5): 135. ^ Lund, Robert (February 1971). "Detroit Listening Post". Popular Mechanics. NY, NY: The Hearst Corporation. 135 (2): 46H, 48. ^ Lamm (May 1971), p. 132. 92.4% of owners questioned said that they would buy another Travelall. Crismon, Fred W. (2001). International Trucks: 100 Years 1907-2007. Crestline. ISBN 978-0970056726. Foster, Patrick (2015). International Harvester Trucks, The Complete History. Motorbooks. ISBN 978-0-7603-4860-4. "International® 1010 Travelall®". International Harvester. 1972. "International Light-Duty Trucks and Scout". International Trails. 1961. Wikimedia Commons has media related to International Harvester Travelall.